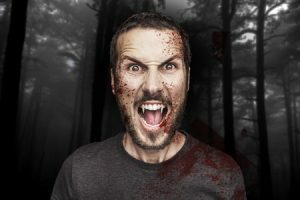 The stories of vampires and werewolves may have been written as fictional tales. But the impetus is very real. Monsters do exist, and they walk among us, disguised as ordinary human beings. It’s not until we invite them inside our homes and make ourselves vulnerable, that they reveal their fangs and claws. Anyone who has been in a relationship with (love, family, work or otherwise) a Cluster B (CB) personality disordered person (Sociopath/ Narcissist/Histrionic/Borderline), knows this to be true. CB’s are Predators who need to feed on others in order to survive. Have you ever felt as though the CB has “sucked the life out of you?” CB’s have a way of twisting your words or actions into a perceived slight, blowing it way out of proportion, and then putting you in the position of defending yourself against the onslaught. And because the CB loves this sort of toxic banter, while a non-CB loathes it, the CB has more stamina and will always “win”, leaving the non-CB depleted, and often apologizing just to make the abuse stop, and wondering what in the hell just happened. The CB does this because she views all relationships as competition. Due to her black-and-white thinking, she believes there are winners and losers and nothing in between. It is all or nothing for her. Because of her abandonment issues, she believes she must dominate, control and bully other people into submission and compliance. She has no means to generate her own happiness, no concept of peace or harmony, and of more prominent importance, a lack of empathy for her victim’s suffering. She believes her victims deserve the abuse she doles out. Not surprisingly, the CB will be stunned and confused when her victims complain of the way she treats them, and even more shocked when her victims figure out how to escape and flee. She will never understand why anyone would not want to be around someone so superior. She will miss you when you are gone, but not in the way a sane person misses someone. She will miss you in the way she misses an old pair of shoes that she threw away because of too many scuff marks. She will be sad that she is temporarily out of narcissistic supply. She never saw you as a real person, but rather as an object she would use to fill her bottomless pit of need. Narcissists are notorious for their rage, which is easily triggered. Unlike the fabled werewolf, whose affliction only rears its head during a full moon, the CB’s rage episodes are spontaneous and not subject to astrological movements. The CB’s rage occurs any time his ego feels threatened. And trying to figure out what will (or will not) threaten the CB’s ego is a losing battle. The CB’s ego is a thin veil that hides a very insecure, fearful and rage-filled, petulant five year old child in an adult’s body. Because the CB is emotionally a small child, he also has the self-restraint of a small child. However, unlike a small child, the CB is too old to be disciplined or punished the way you would if a five year old was throwing a tantrum. The CB is in a fully grown body and is not above using physical violence to demonstrate his anger. Because the CB has the coping skills of a small child, real life “adult” issues that would be sticks in the road for a sane person (such as bills, co-workers, traffic and sharing toys), are insurmountable mountains for the CB. The CB goes through adult life in fear of adult issues, so he tries to intimidate the people around him by behaving the way Monsters do on TV. If he’s lucky, he will find a co-dependent spouse who feels pity for him and chooses to take his abuse AND parent him, as well. The CB believes that if he is scary enough, the mean people will go away. Because he is so afraid, he goes through life with a chip on his shoulder, constantly in fear of his inadequacies being exposed. The CB lacks the emotional maturity to contain his rage and he often rages unprovoked. The only way you can survive a relationship with a Werewolf is to grab your valuables and leave without saying goodbye. Physical violence is NEVER acceptable. Grab your silver bullets and GO. There is no cure for being a Werewolf. And even if there was a cure, the Werewolf does not want to stop raging. Being enraged makes him feel powerful. You take your power back by not being his victim. You can’t stake what doesn’t exist. All true. Thanks for the validation and for helping to raise awareness Pam. You can tell people over and over how toxic they are, but sadly they will never understand the amount of destruction they can cause to your life and your soul unless they’ve been through it. The journey back is long and difficult. Nobody tells you about the PTSD and obliteration of your friends, family, finances, children, possessions, and ability to experience joy when they speak about unhealthy relationships. From a survivor’s point of view terms like “unhealthy” and “toxic” are major understatements. It’s so bad that we aren’t sure how we made it through really. Many of us actually don’t. Suicide during or after one of these relationships isn’t uncommon. Thank you for your reply, carrmic. People who haven’t lived it won’t understand it. Welcome to the forum! Wow. This fits my current girlfriend. Like tonight, I just asked my girlfriend whether or not her son obeyed her when she asked him to stay off of the xbox. I immediately was scolded and told that I was pitting her against her son. I was given the cold shoulder for about 4 hours. When I did get her ear by text, I said that it had nothing to do with that, just that I was wondering if he did what she told him. She said she is still pissed at me, saying that there was no other rationale of why I asked that. Talk about a wholly misunderstood and blown out of proportion situation. Sounds like a diversionary tactic to me. Love this. I’ve often said my CB ex does not cast a reflection in the mirror, ie she can’t see her own crazy behavior. She can’t stand the light of being exposed for her BS or the truth of her abusive actions. I actually did a lot of reading in vampire legend to figure out what metaphors of dealing with them might possibly work. They hypnotize you/put you under their spells. They slowly drain you. I used to visualize her being in a circle of her family and social circle exposed in The Light and imagining all the people in her life really seeing what she was and finally understanding what a monster she is; seeing all the things she so skillfully hid from the world. Her biggest fear was that the truth would come out and she would be exposed, which resulted in the proactive smear campaigns, (legal, social, professional and digital) she used to distract people from what was really going on. I read somewhere that throwing poppy seeds in their path slows them down because they have to stop and count them and organize them. I think it has to do with how they lose their rational cohesion when they get confronted with reality. Weird but I tried it; just dusted the path to her house when I was picking up the kids one day. I don’t know if it worked but it made me laugh. I used to keep a bag of them in the car just in case of a confrontation. That’s really funny about the poppy seeds. Maybe I can find one of those antique rings that have a little compartment and keep some poppy seeds in it. In case of a sudden Narc sighting. Might work better if you throw it in their eyes, though.